We no longer sell Next Innovations products as their greedy business practices only accept orders over $300.00 as per Lisa in their sales department. They also refused to sell accessories such as swivels to support previous products purchased. We will only sell the remaining Next Innovations inventory and no longer purchase any products from this company. Our Stainless Steel products by DSA are a much more superior product in terms or durability. 3D Wind Spinners carries many metal spinner ornaments. If you don't see the Spinner you want on our site, contact us and we will inform you with price and availability. If you are looking for unique gifts for a family member or a friend, these metal spinner products are beautiful, different and new. Where can you place a Metal Wind Spinner in and around your home? 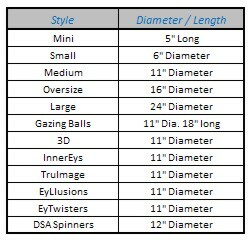 sure to tell them 3DWindSpinners.com where we have satisfied thousands of customers.